Our wedding is only a month away! I cannot believe how quickly everything has come together. 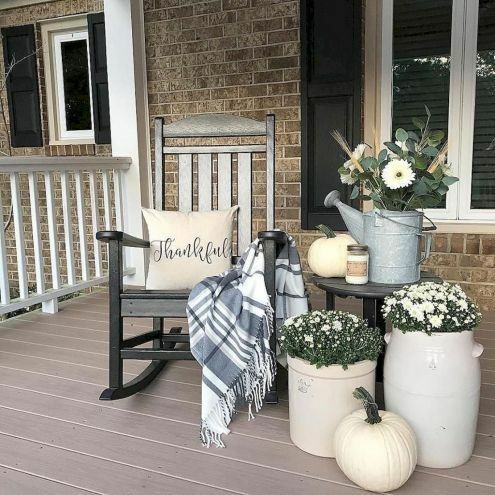 We have been working on the finishing touches and the weather has not cooperated with my projects. It has been non stop rain. I’m hoping this means it will be nice and dry by the time the wedding day is here. 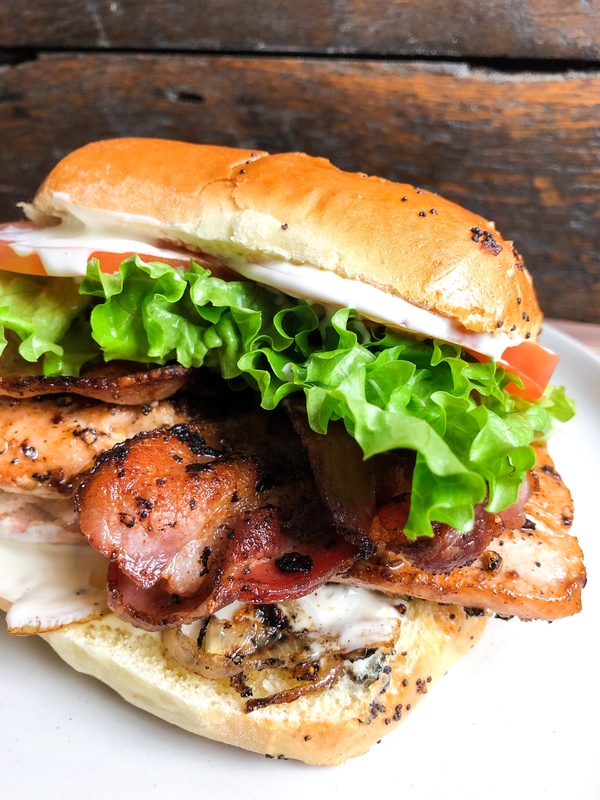 These Salmon BLTs are perfect for adding a little freshness during this dreary weather. 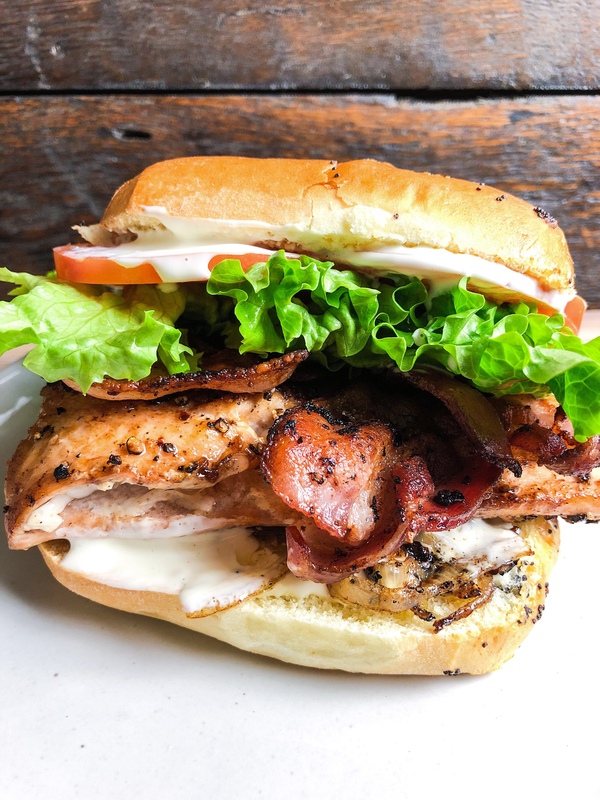 Lemon aioli, spicy pepper bacon, juicy tomato, and fresh cut lettuce all do their part to liven up my favorite salmon. You can use Texas toast or a lettuce wrap for these. We like the Publix onion rolls. They soak up all the aioli in the best way. Now there is nothing left, but to enjoy multiple times a week! We are finally moved in to our new house! Well technically we moved in 3 weeks ago, but I finally had a chance to move all my photography props and lights into our make shift studio. The natural lighting here is so amazing and I am excited to start working on recipes. We have so much more room here. At our last place (while we loved it) everything just felt so cramped and there was not much kitchen space. I am just so inspired here in the new space! 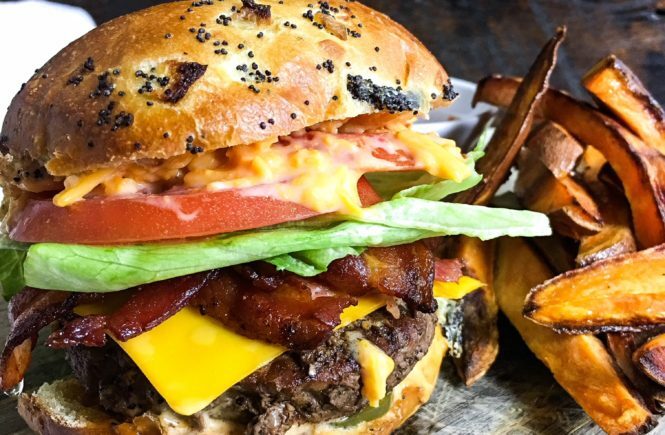 Now lets talk about these pimento cheese burgers! 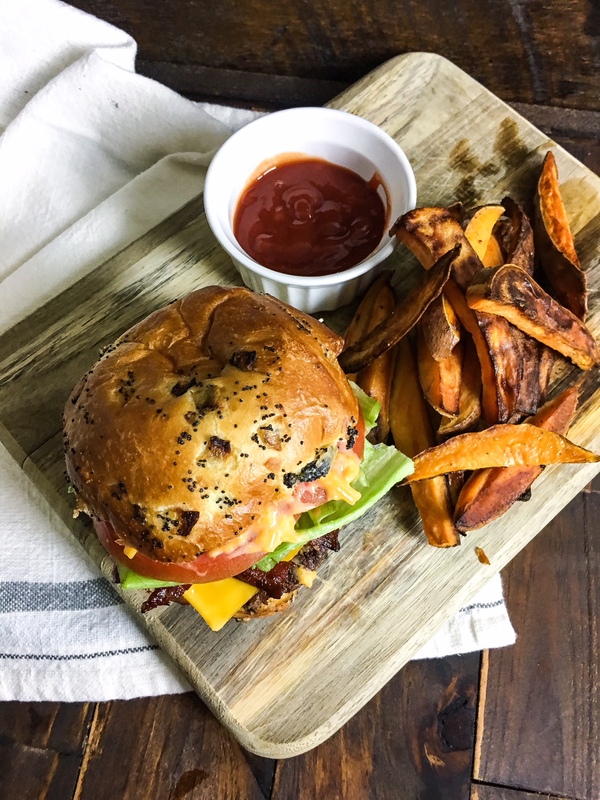 These burgers are the first recipe I photographed here! 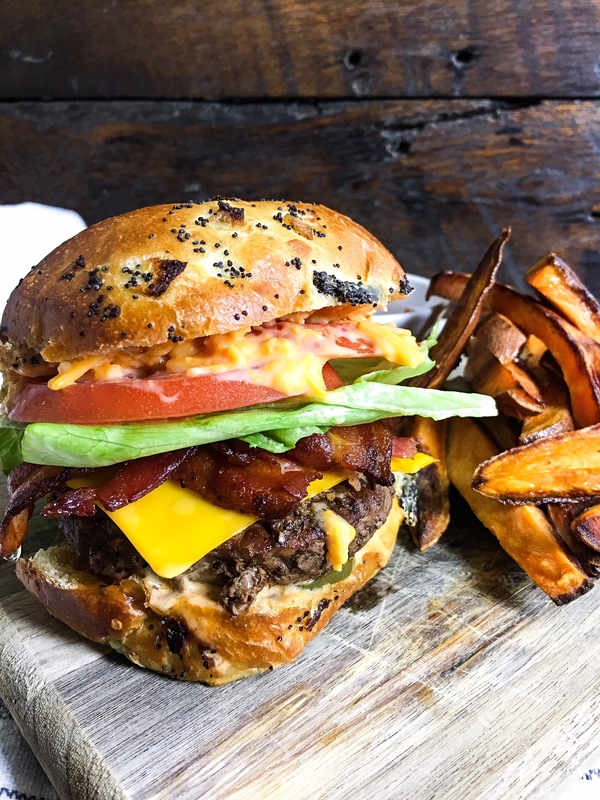 Perfectly soft onion rolls with a medium rare steak burger topped with melted cheddar and pimento cheese. 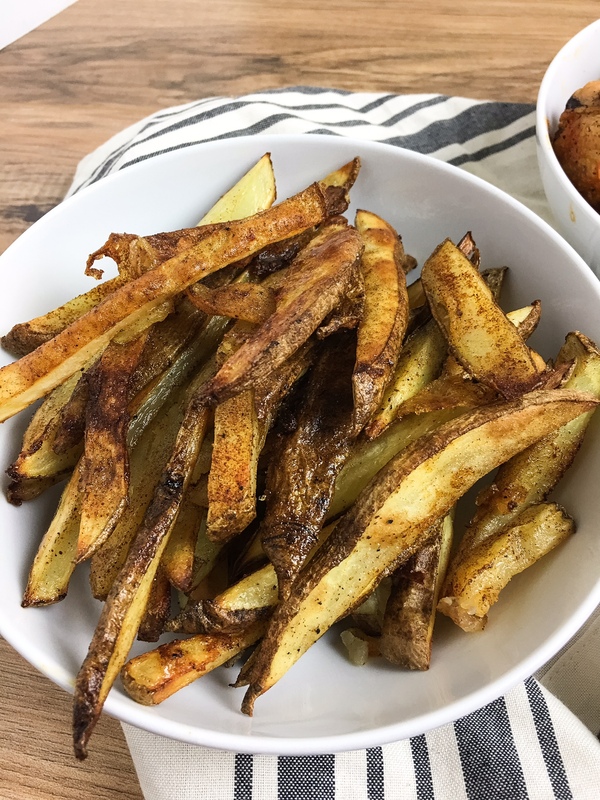 The perfect side for me were these garlic sweet potato fries! 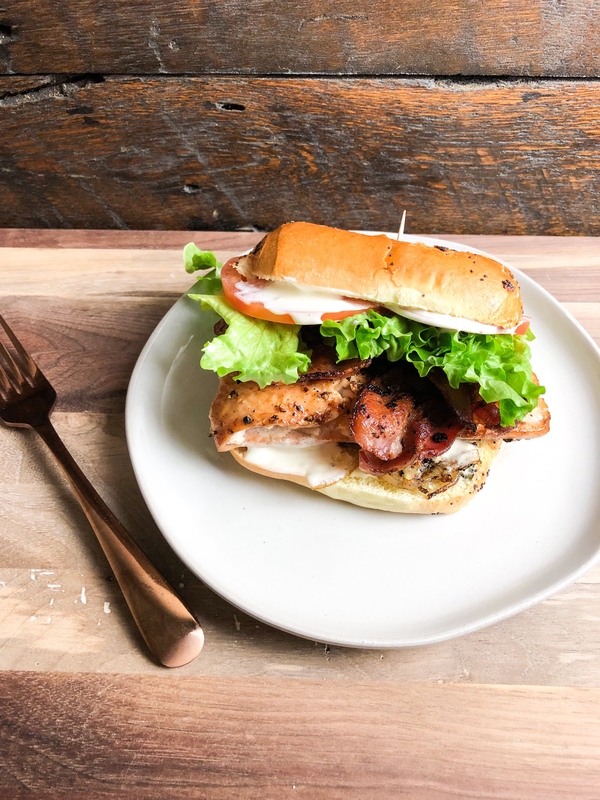 We served ours with lots of dill pickles, fresh tomatoes, lettuce and crispy bacon. After uploading these pictures I am absolutely craving another bite. We just bought a hot sauce called “the sauce”. It is so peppery and tart! I would love to tell you we did not go through a whole bottle in 2 weeks, but… we did. 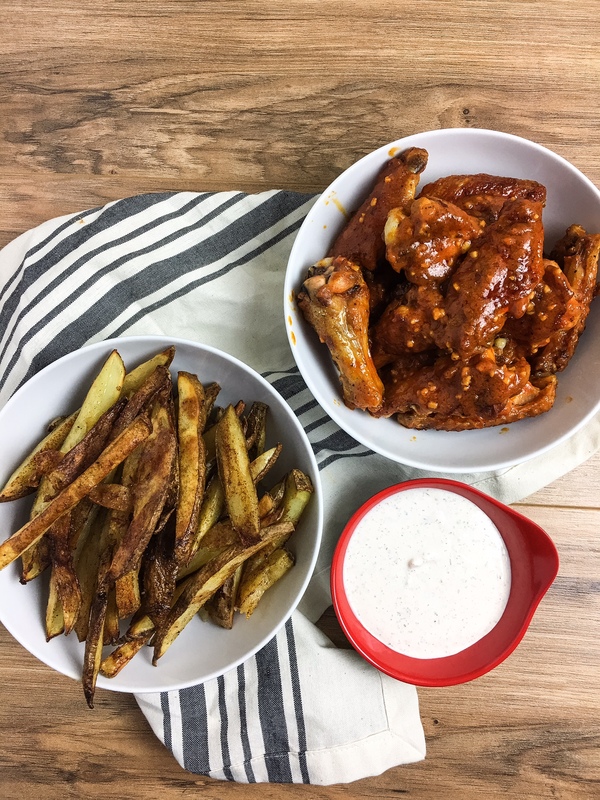 I highly recommend a side of hot sauce for these garlic fries. 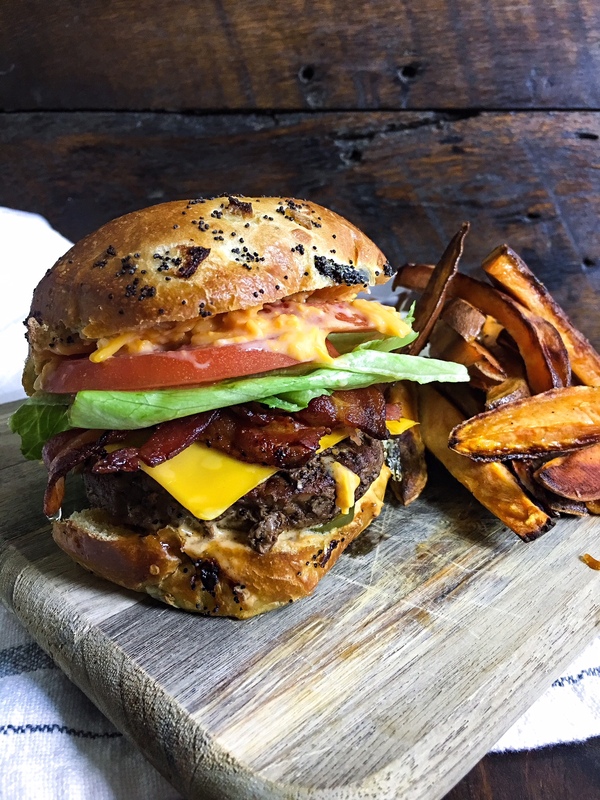 Pimento cheese burgers topped with lots of fresh ingredients! Okay. That’s it. I am convinced that beef short rib meat is the only meat I will ever need. forever. 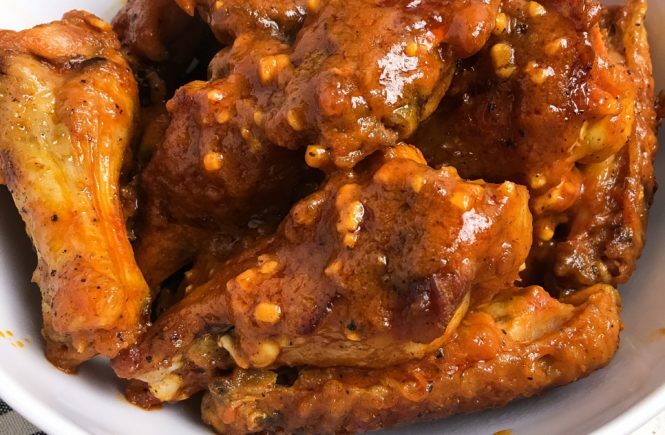 Something about it just always results in the most tender juicy bites. Even though we have a constant rotation of beans, beef, chicken, various sea foods, and pork I always end up back at beef short ribs. We use them in every kind of recipe. So it shouldn’t surprise you that short rib chili is up next! I’ve always grown up eating ground beef chili or turkey chili. When I met Patrick he never liked any ground meats in my recipes. So I would start butchering my own cuts of meat tailored to the recipe. 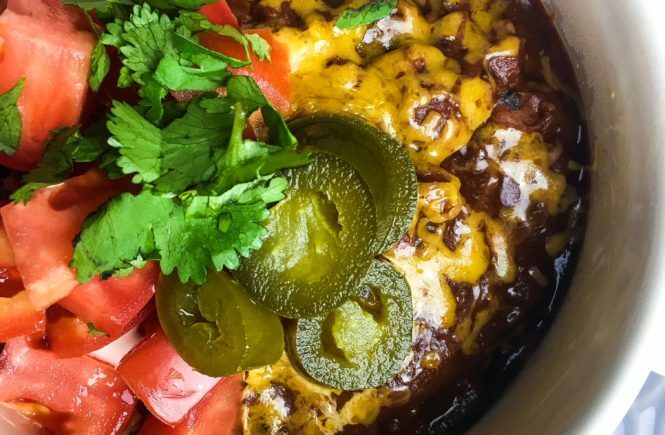 This short rib chili was made in the instapot. It is packed with flavor and ready in 30 minutes. 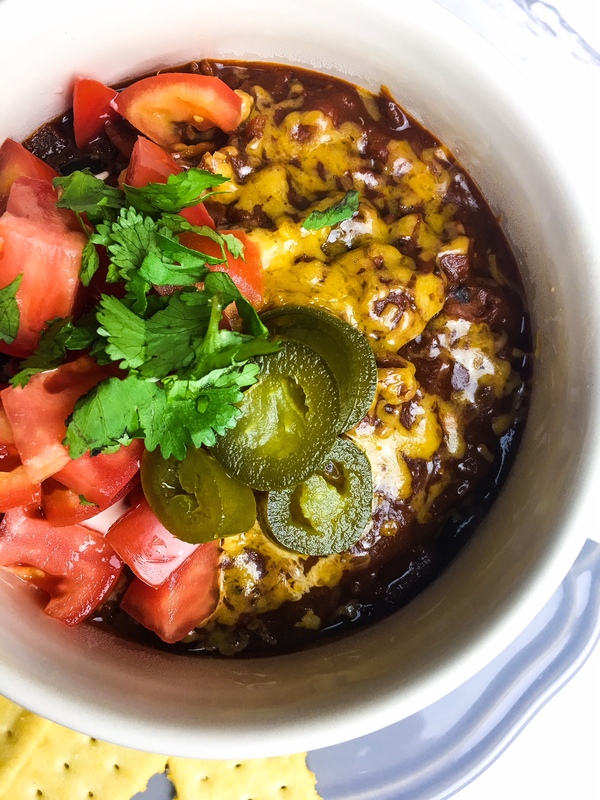 You can definitely skip the meat in this version and have a vegetarian chili. I promise it would be just as good. This whole recipe really comes down to one very special ingredient. 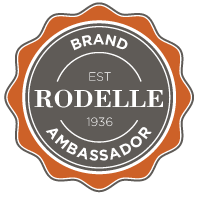 Rodelle organic cocoa powder. I’ve been putting cocoa in my chili for years, but something about the Rodelle cocoa really takes it over the edge. It is such a dark pure powder that pairs perfect with the chili spices. You can’t taste cocoa at all. It just gives the flavors so much more depth. This is the kind of meal I want in cold weather after a long day at work. It is so warm and filling. Perfect with a generous sprinkle of sharp cheddar. 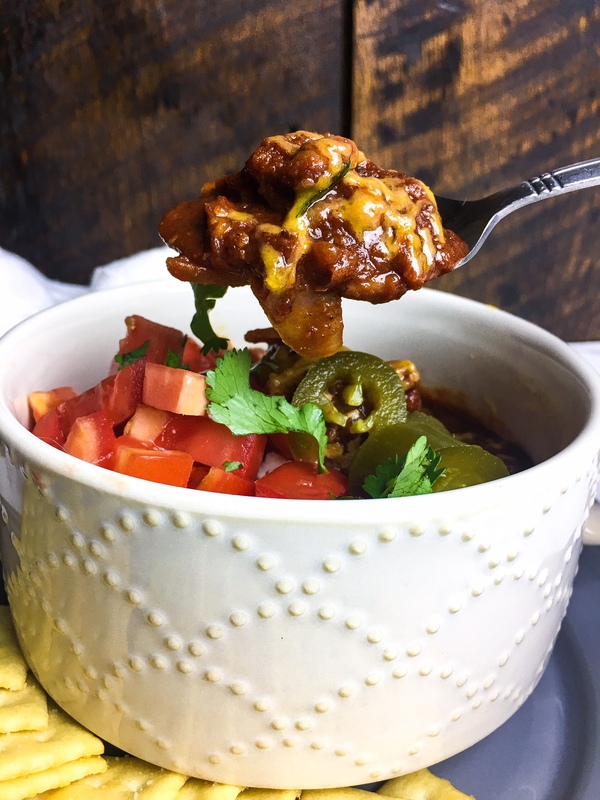 Rich beef short rib chili. My favorite foods always incorporate some sort of fusion. We love foods from all cultures and sometimes we are torn between multiple dinner ideas. The easiest way to compromise is to fuse the two! PS. my mom gave us an insta pot for Christmas and we have used it almost every single day since. I seriously cannot recommend the insta pot enough. It makes life so easy during the week. 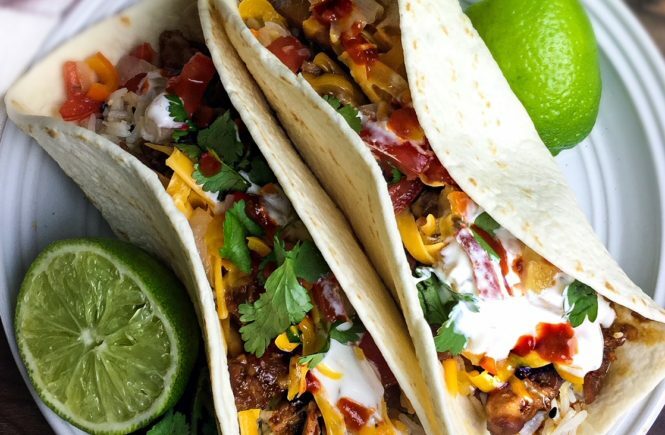 You can make a full meal in 20 minutes. Mind blown. The filling is delicious enough to stand alone. So if you wanted to make this even lower carb you can use a lettuce wrap instead. 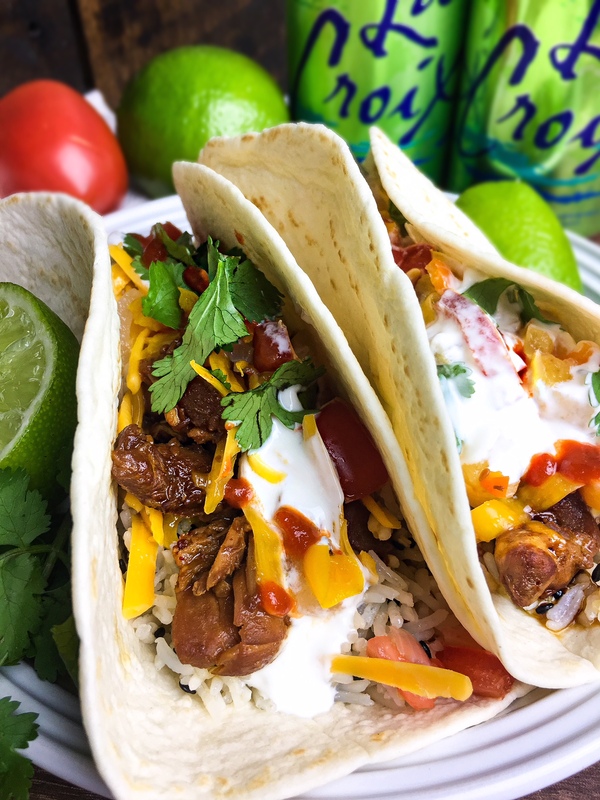 We used low carb mission tortilla wraps and went very light handed on the rice. 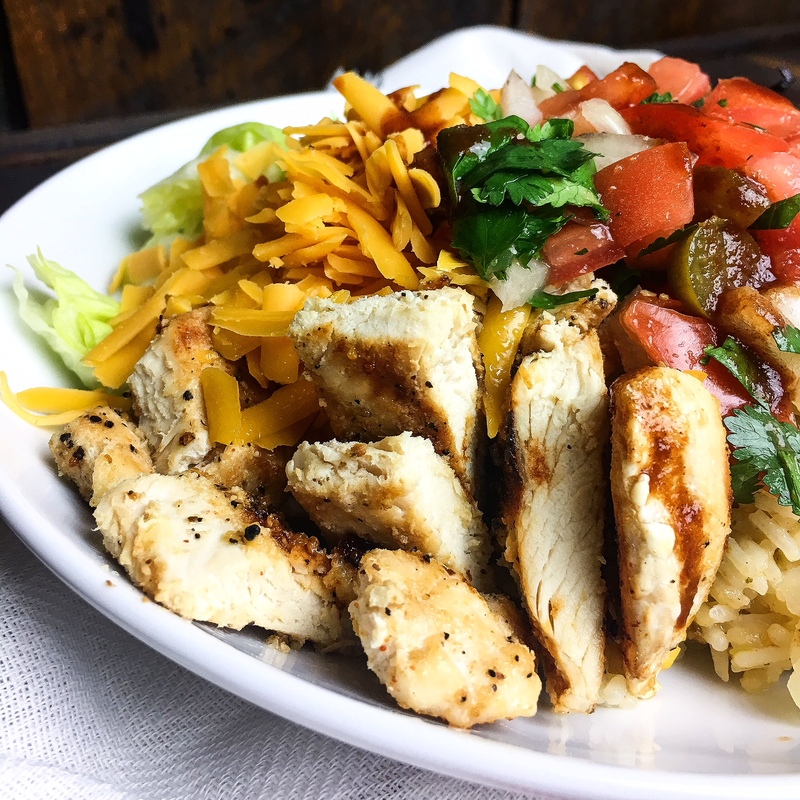 A layer of sesame ginger rice, teriyaki chicken, cheese, pico, sour cream, and hot sauce. Plus lots and lots of fresh lime juice. I will probably need to make these again this week after writing this. All my favorite flavors wrapped up together. Not sure what else I can ask for in a dinner! Sesame ginger rice, teriyaki chicken, cheese, sour cream and hot sauce! In a roasting pan lay out the chicken thighs and season with brown sugar, garlic powder, cayenne pepper, salt and pepper. Cover with onions and pineapple then drizzle teriyaki on top. Bake for 30 minutes, cool and shred. If making in an instant pot- use saute feature to brown the chicken and onions, switch to the stew/meat button. Season with salt pepper, cayenne, garlic, brown sugar, pineapple, and teriyaki. Cook for 15 minutes. Mix basmati rice with melted butter, ginger, and sesame seeds. Season with salt and pepper. 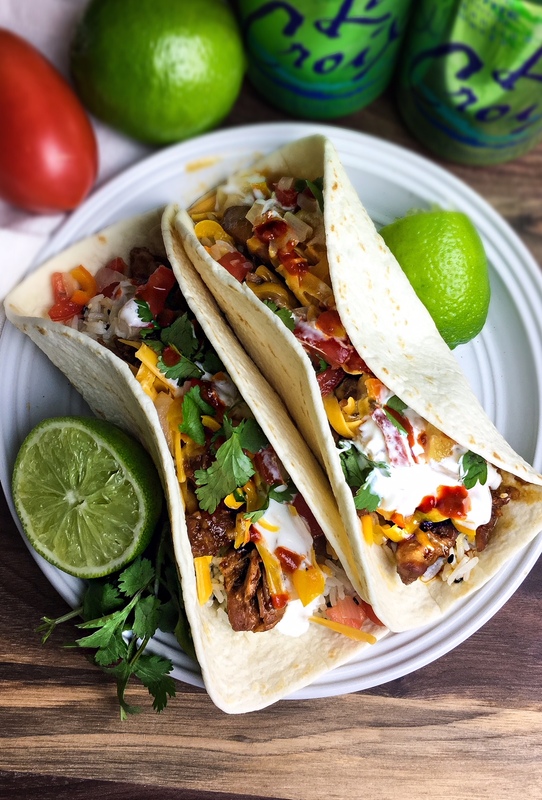 Fill tortilla with rice, chicken, cheese, sour cream, and pico. Are you ready to run out and make these? I promise you will not regret it! 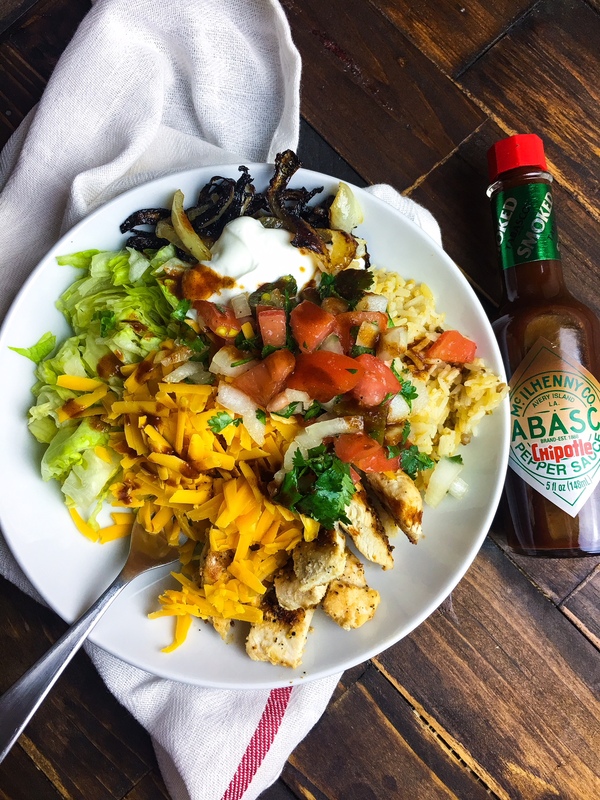 One of our favorite new go to meals during the week. 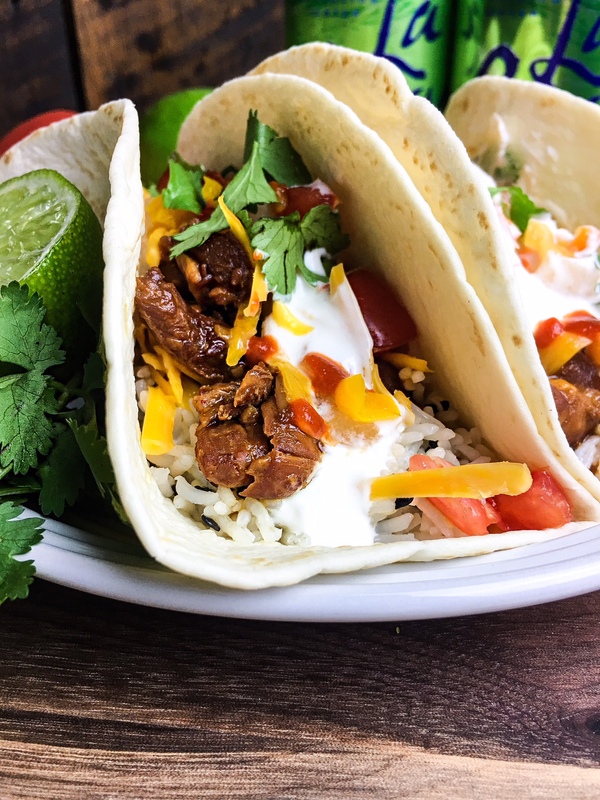 So fast, easy, and delish! 2018 is here! I can’t believe how fast the holidays flew by for us! I know everyone usually says “new year. new you”, but this year I have a wedding to get ready for! My game plan is a better healthier version of myself. We already cleaned up all the holiday decorations and removed a lot of the holiday sweets from the house. Now I am not a big snack person, but I think that is what has been holding me back. So instead of my usual one medium meal and one big meal a day I am going to have tiny meals throughout the day. I have also decided to give up diet coke Sunday-Friday. If I do well during the week I’m going to allow myself to have it on Saturdays because it really is my all time favorite treat. One of my favorite foods in the world are burritos. Breakfast, lunch or dinner there is a burrito for every time of the day. Obviously burritos are not going to help me on my health journey so I had to think outside of the tortilla. 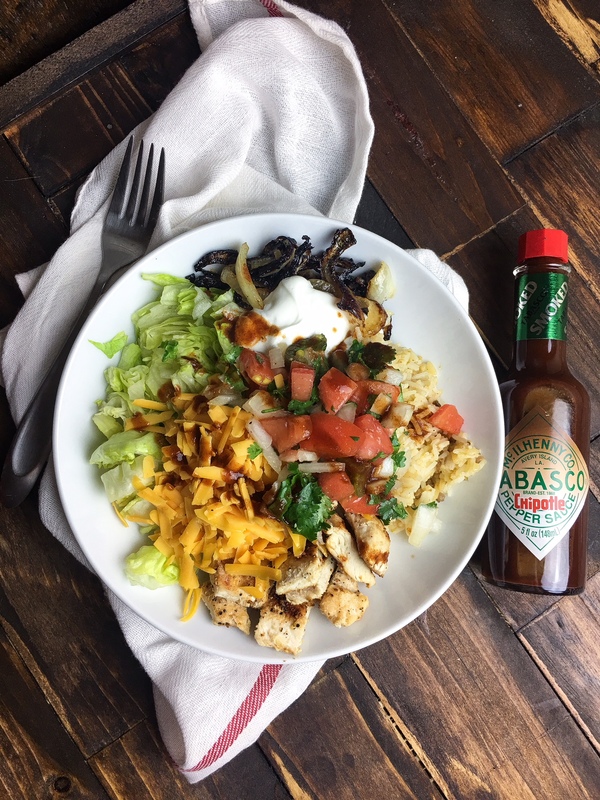 Burrito bowls are my go to at places like Chipotle, but I wanted to make it a little bit healthier. You can definitely switch out the ingredients that I used to make it even lower in calories. The most important ingredient for me is the homemade pico de gallo. I could eat this on literally anything. Yesterday I had some red pepper hummus and celery, but I topped each bite with pico because I am obsessed! 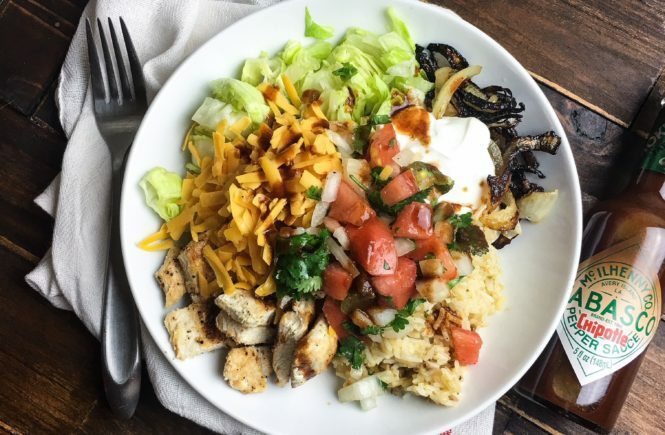 Healthier burrito bowls filled with grilled chicken and veggies! I love lots of hot sauce on mine and a little sour cream! 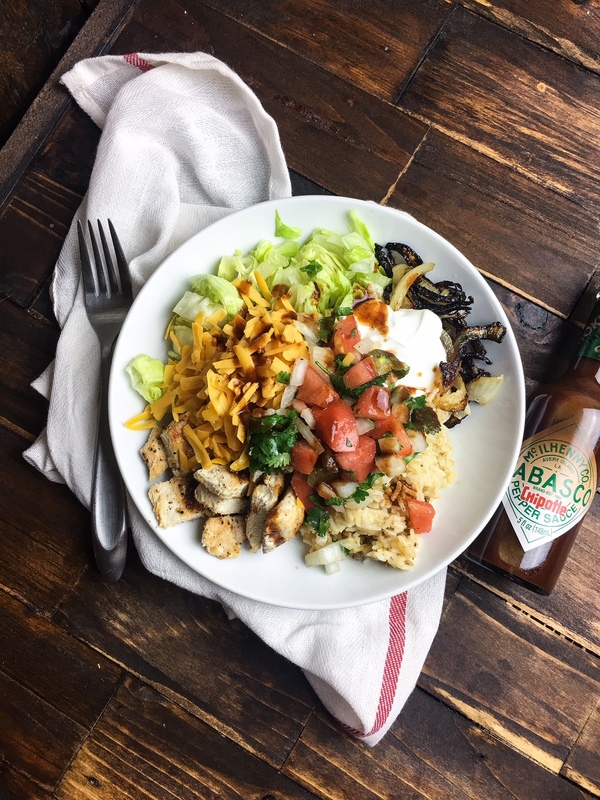 I hope you all try to make your version of a healthier burrito bowl! Happy New Year! 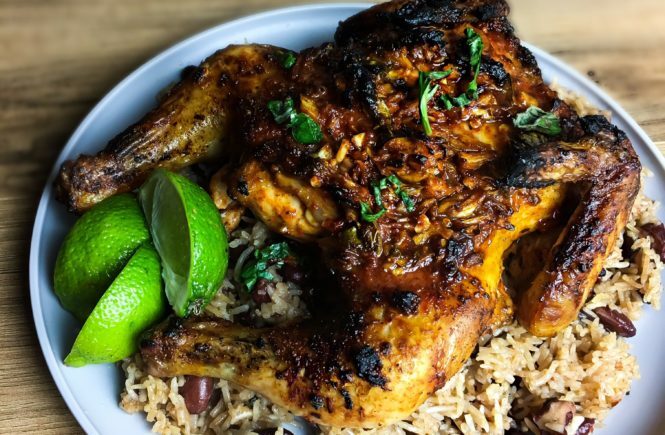 This Jerk Chicken is a game changer! I actually had a dessert planned to go up today, but we have made this multiple times in the past two weeks! 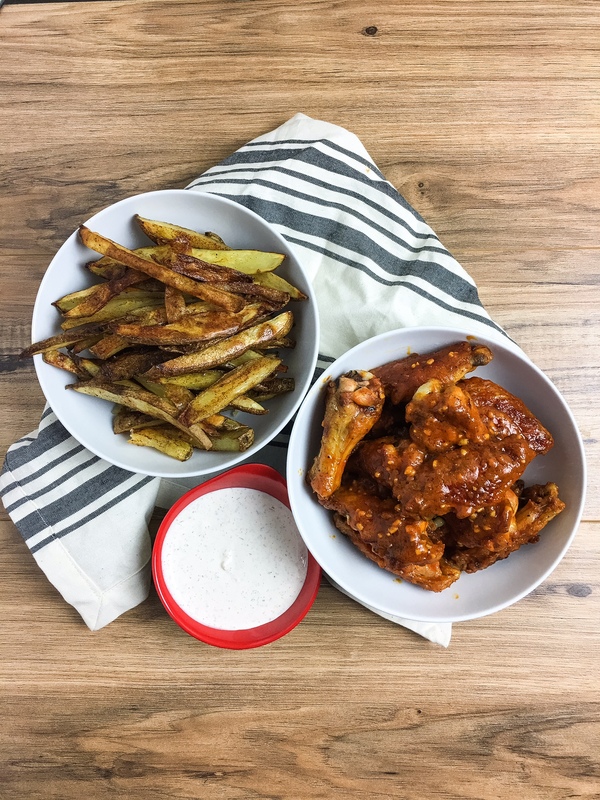 With the holidays right around the corner I knew you guys needed this recipe… TODAY! I love this dinner for multiple reasons. One- there is hardly any prep work. Everything is thrown into the oven and you can forget about it until they are done! Two- it is super cheap! 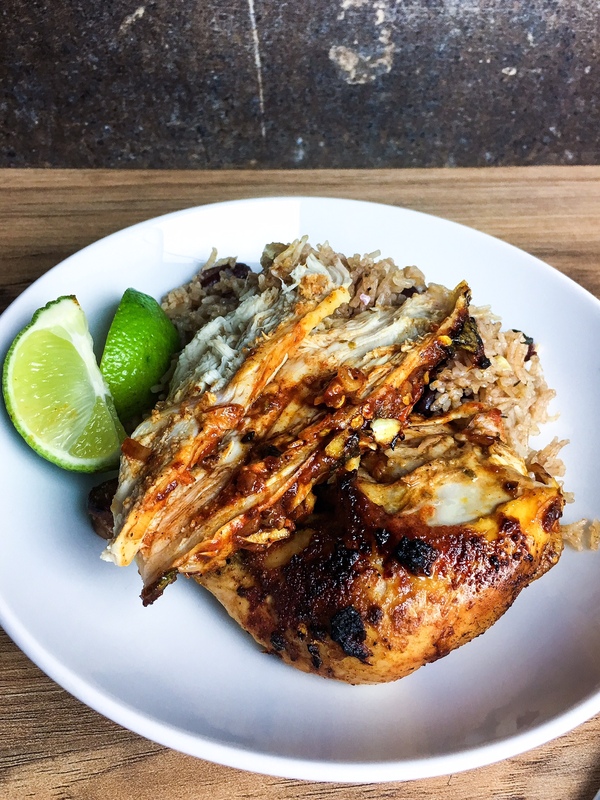 Depending where you buy your chicken you can make this whole meal for $10-$15! Three- the flavors are out of this world! 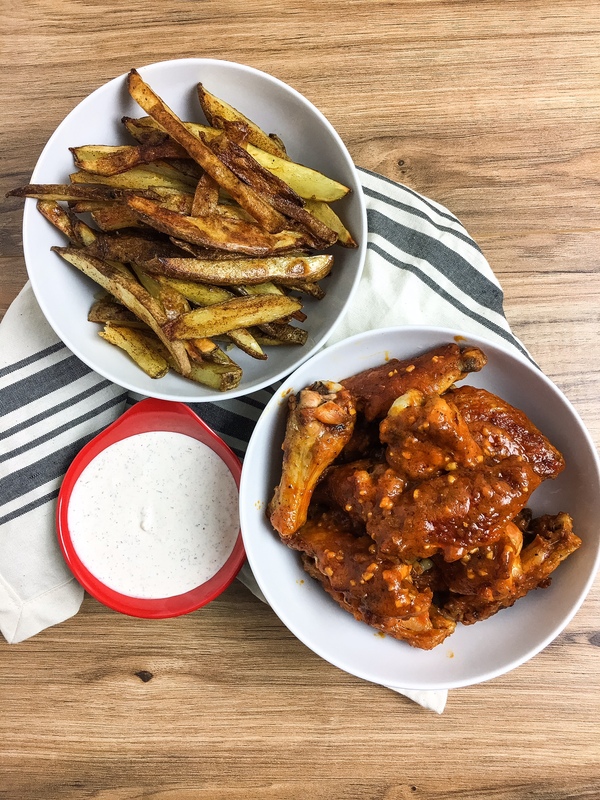 This recipe is based off a recipe from my new favorite YouTube channel, Sortedfood. It is a channel about 3 friends that learn new cooking techniques from their 2 chef friends. I cannot stop watching! They are so creative and they mix flavor combos that you just can’t find anywhere else! 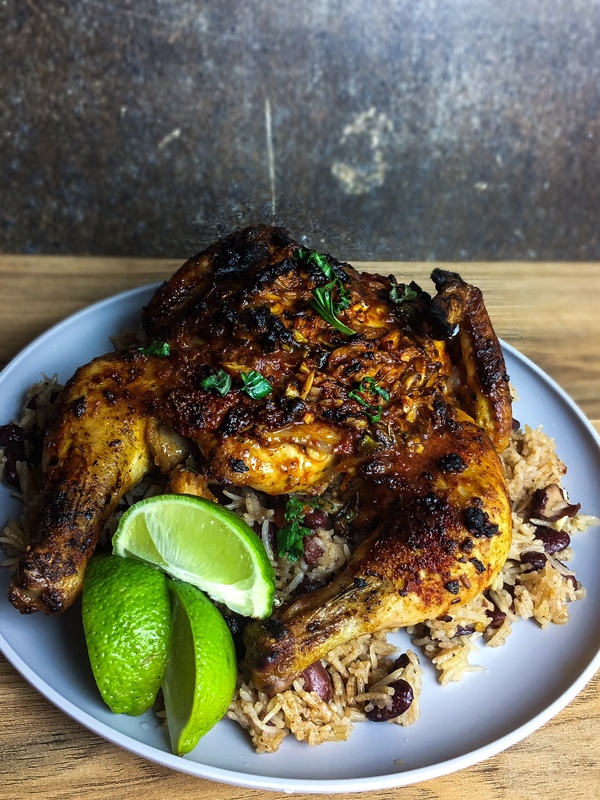 When I saw their version of jerk chicken I knew I had to make it immediately. As in I finished the episode and scavenged my kitchen in search of ingredients. I didn’t follow their recipe exactly, but I did follow their chicken butchering skills! The most important part of the dish is making sure you spatchcock the chicken (aka take out the backbone). This allows you to really get the marinade into each part of the chicken. I have never had such juicy meat before and we tried this technique with a few different sizes of chicken. 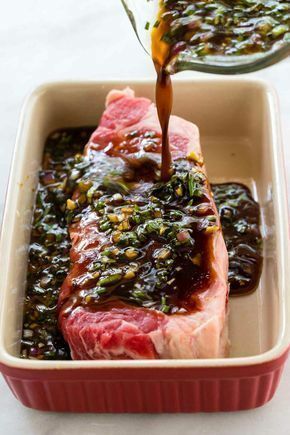 I love this marinade because you get so many levels of flavor. 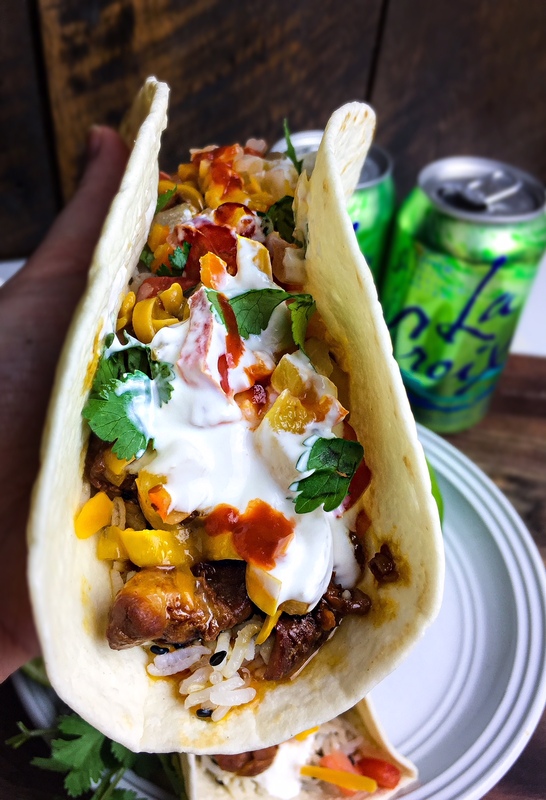 The heat from the cayenne, the freshness from the herbs, and the bitterness from the lime zest all come together for the perfect balance. 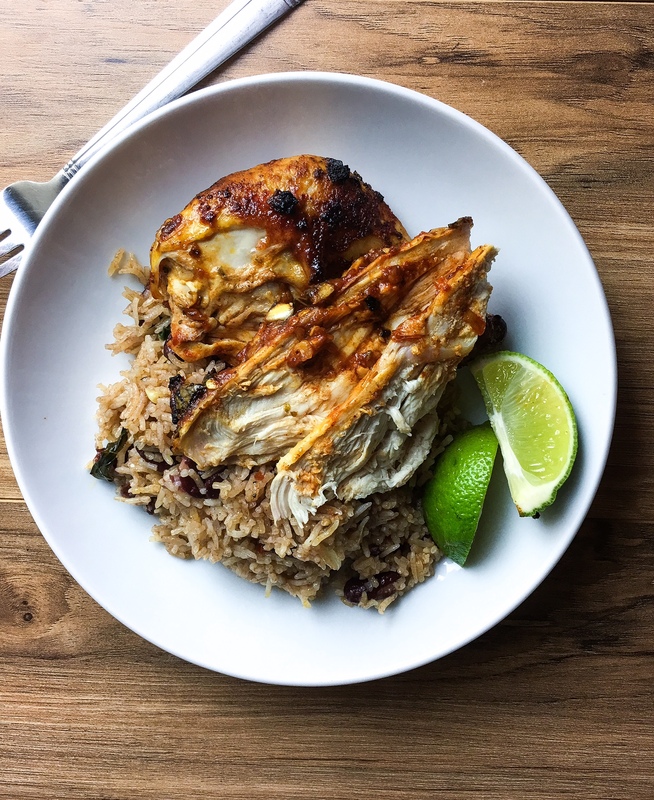 Jerk chicken bursting with flavor over a fluffy bed of rice and beans. Dress with a little more lime juice! I think next time I am going to try this recipe with a small turkey! I just want all these flavors all the time now. 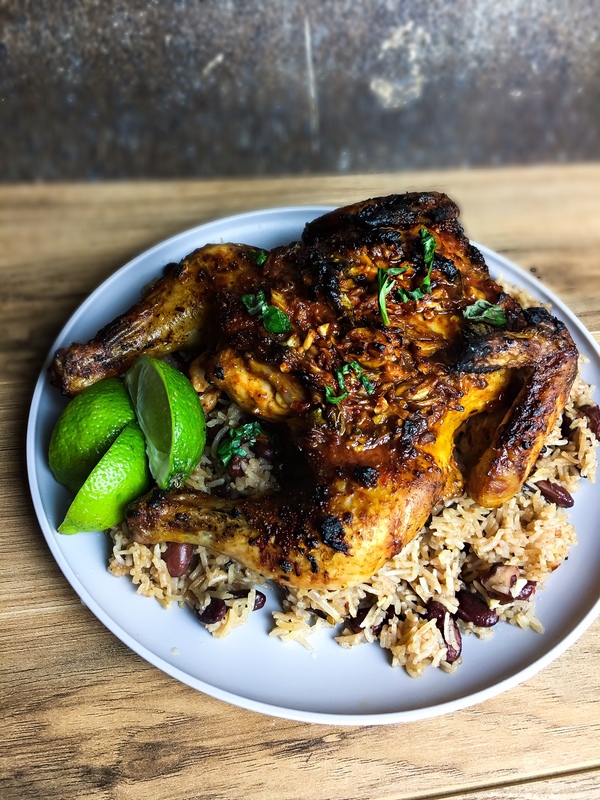 Seriously one of the easiest most delicious chicken recipes I have ever made! **This is a sponsored post written by me on behalf of RAGÚ® Pasta Sauce. All opinions are entirely my own. I am all about fresh ingredients. I often talk about places I love to shop. The biggest factor in keeping me as a customer is consistent, quality ingredients. Thankfully I have a Publix right around the corner so it is easy for me to run and grab what I need. One of the biggest reasons I blog is because I am always in the kitchen creating! As my recipe starts to come together, I always think of ingredients that would just take the food over the top! There are often times when I will go to the grocery store multiple times in a day. It is important that I have a place I can count on. If you are a frequent Publix shopper, you already know they usually run a great buy one, get one special. Publix is running a BOGO on RAGÚ® Pasta Sauce NOW through Wednesday, October 11th. This is the PERFECT time to stock up. RAGÚ has so many different sauces to choose from, and they could be a great base for any meal. 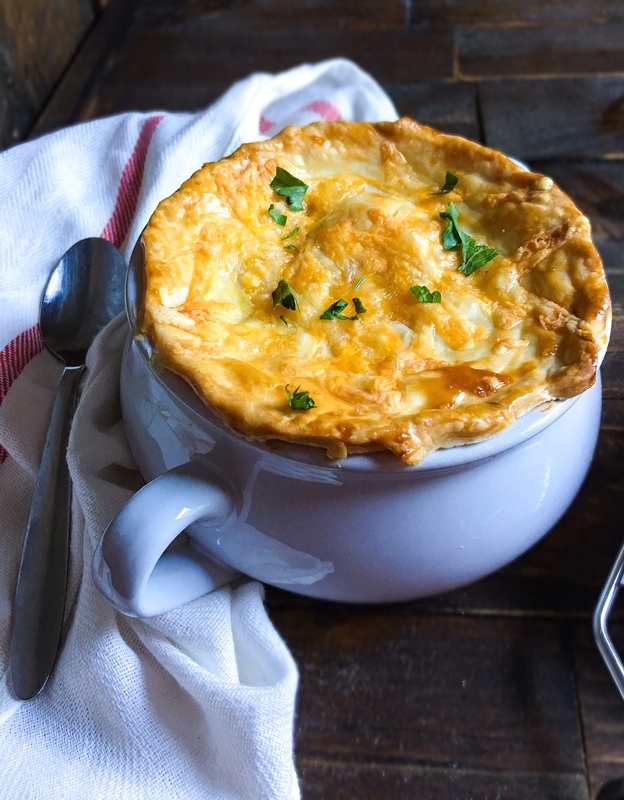 Now that it is officially fall, I am all about good, warm comforting food! Creamy, cheesy, chicken just keeps popping into my head. I was thinking about creating a soup, but it is still fairly warm here in Georgia. When I was making my list of ingredients, Patrick asked if I was making a pot pie. Umm now I am! 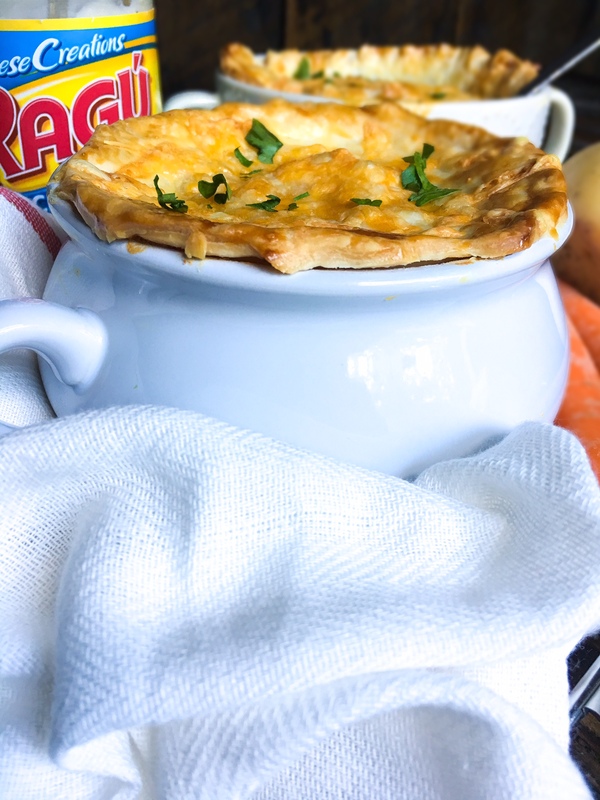 I used the RAGÚ Family Size Cheese Creations Classic Alfredo Pasta Sauce as the base for my Cheesy Chicken Pot Pies. 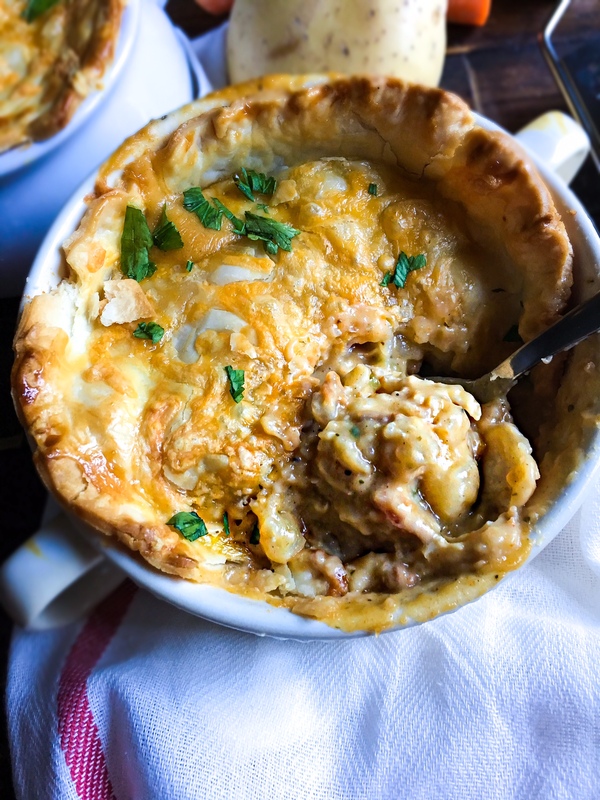 This sauce is usually known for Chicken Alfredo, but since it is already packed with real cream and fresh cheese, it is also perfect for an easy pot pie! All that Parmesan and Romano cheese in this sauce is right up my alley! 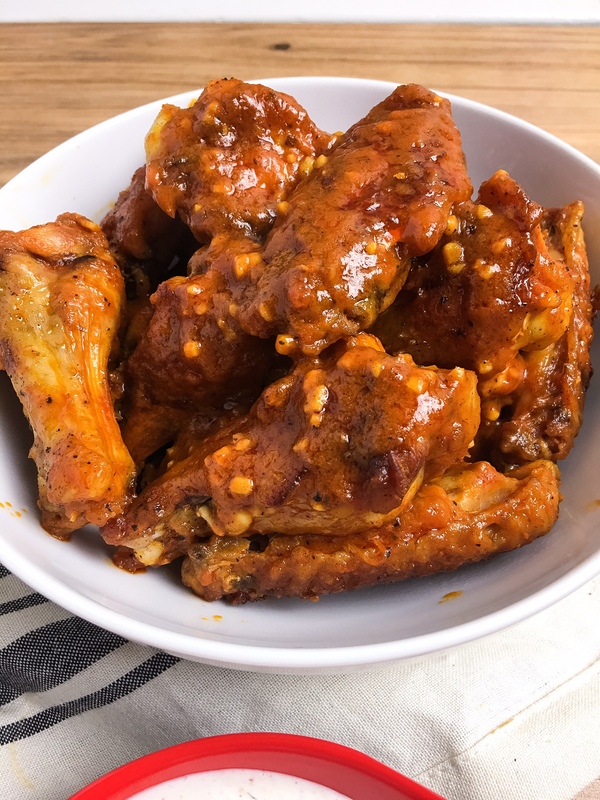 I used the family size, but you can also reduce the recipe and use the 16 oz. if you are serving less people. 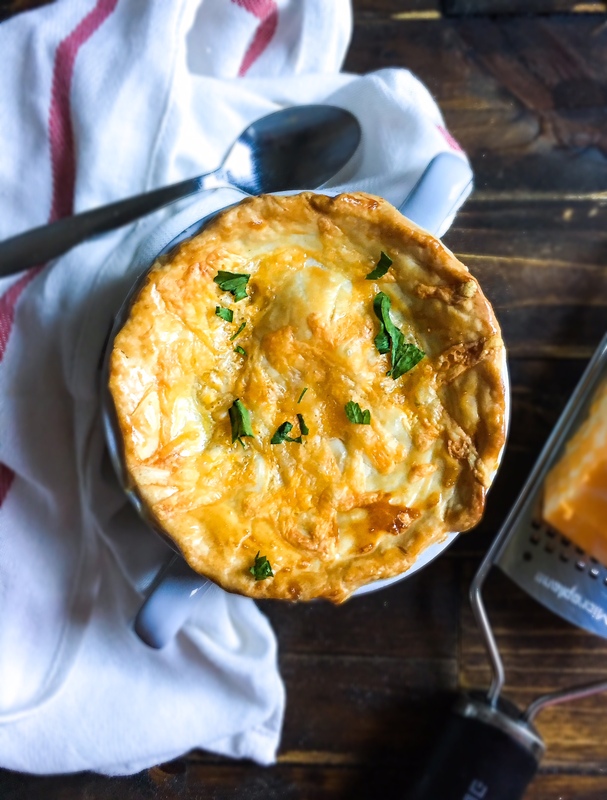 You can make a giant pot pie for the family, but I love making individual pies. 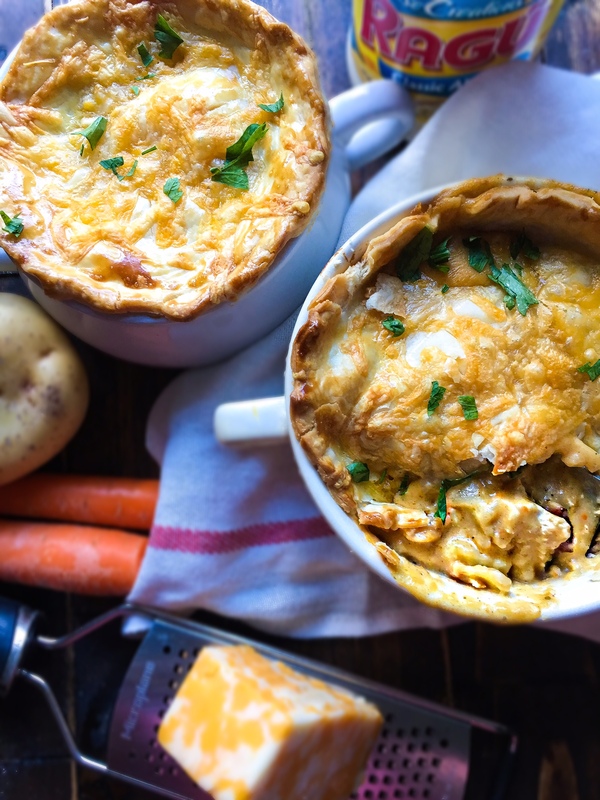 A really satisfying creamy base packed with vegetables topped with a crispy pie crust. Is it dinner time yet? In a large sauce pan add the chicken and stock. Bring to a boil, lower heat and simmer until chicken is cooked through. Pull chicken out and set to the side to cool. Add the onion, celery, carrots and potatoes to the chicken stock. Simmer until potatoes and carrots are fork tender. 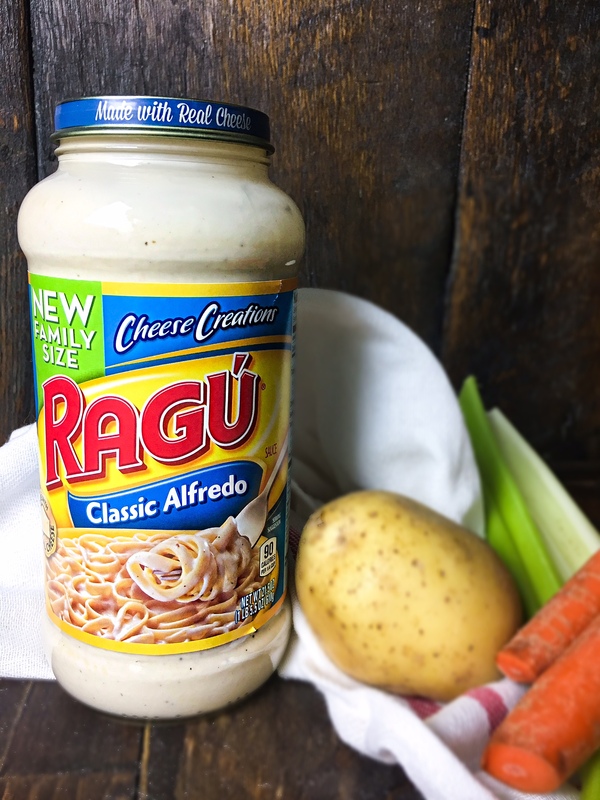 Add the jar of RAGÚ Classic Alfredo. Lower the heat to medium low. Shred the chicken and add into the pot. Pour in the pepper, paprika, garlic, and garlic powder. Add ½ cup of the cheddar, butter, and the bacon to the pot and turn off heat. Pour chicken mixture into individual oven safe bowls. Top each bowl with a circle of pie crust, I used the top of the bowls to measure the dough. Mix the egg with a tbsp of water and brush onto each crust. Bake for 25 minutes or until crust is golden brown. Top with fresh herbs and enjoy! 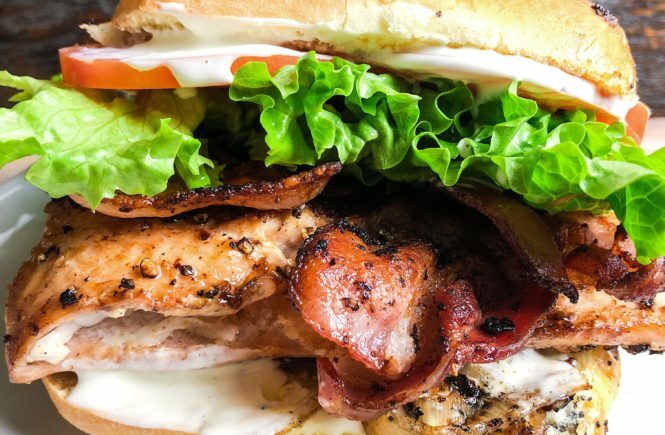 Is your mouth watering yet? 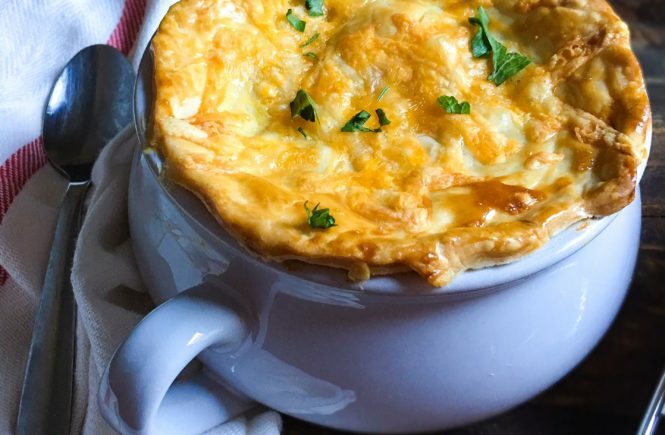 Just image tapping your spoon through this cheesy crust and revealing all that creamy chicken. 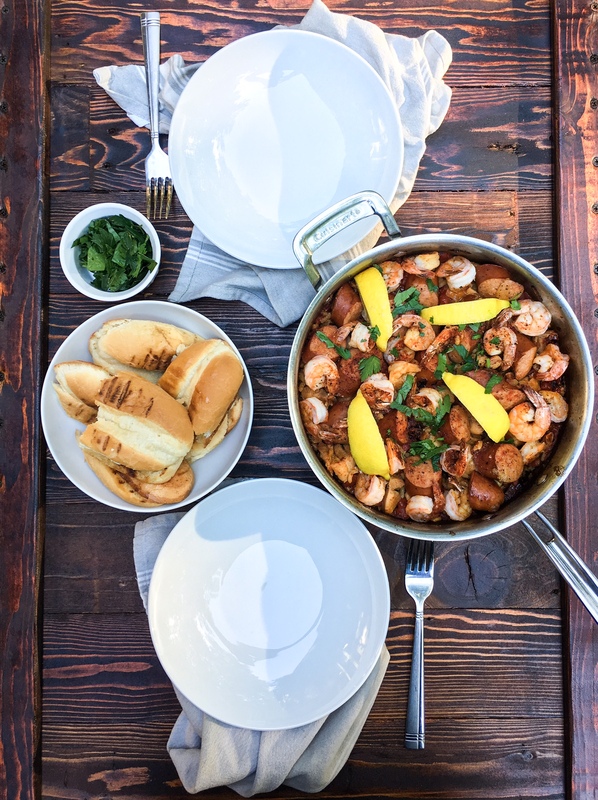 This meal will definitely bring smiles to the dinner table! You can check out the BOGO deal here through the Publix Weekly Ads. Be sure to get RAGÚ Pasta Sauce. It can easily be found on the pasta sauce aisle at Publix. 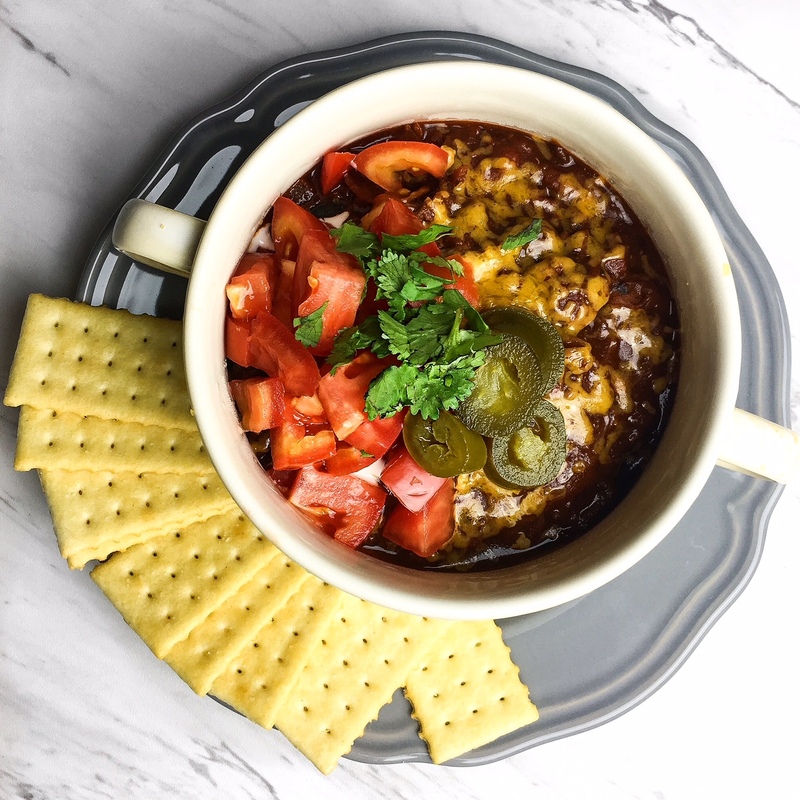 Don’t forget to tag me if you recreate this recipe! I love seeing all your recreations! 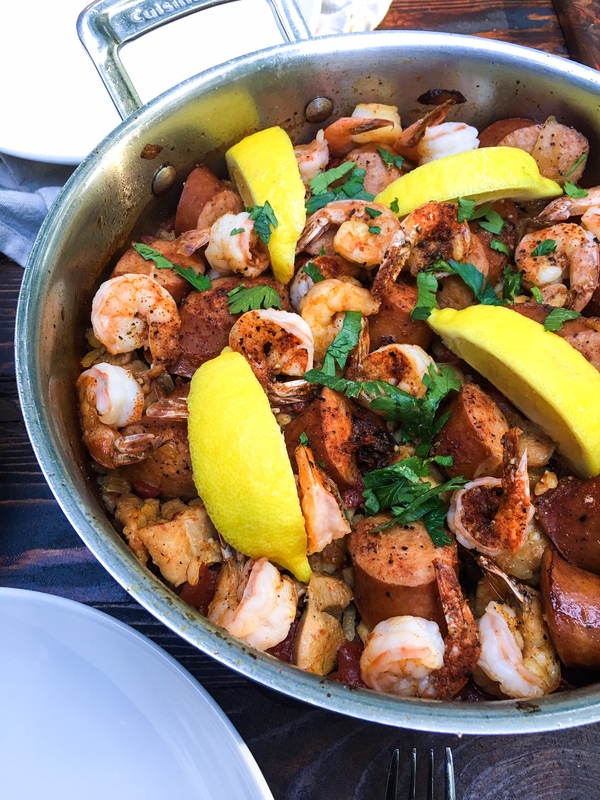 A few months ago we went to Pappadeaux for dinner. I convinced Patrick to try the dirty rice. He always orders fries and the rice at Pappadeaux with lemon butter is out of this world! 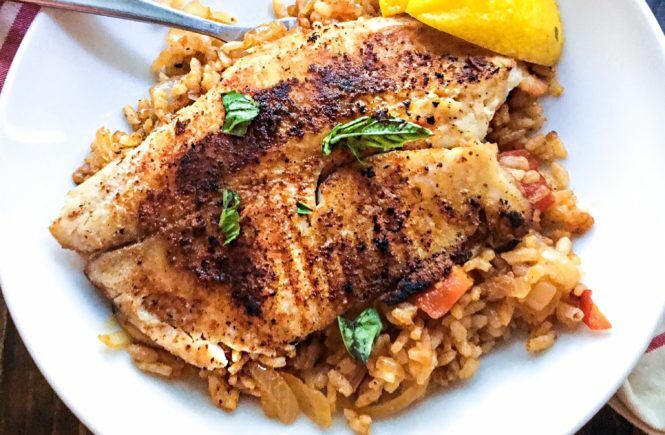 He ordered some sort of blacked fish with crawfish and lemon butter over dirty rice. We still talk about how good that combo is! 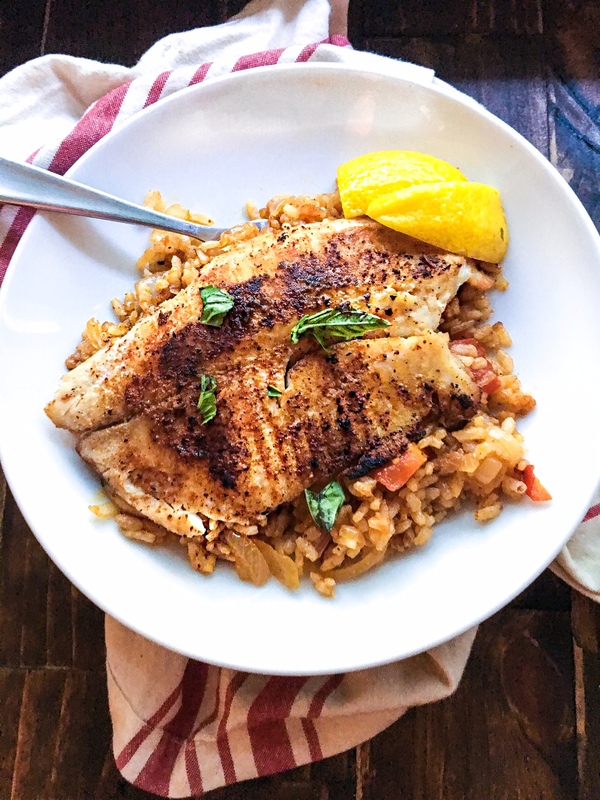 I don’t know if this recipe really qualifies as dirty rice, but it is soooo good with grilled fish. We eat this dish at least once a week. 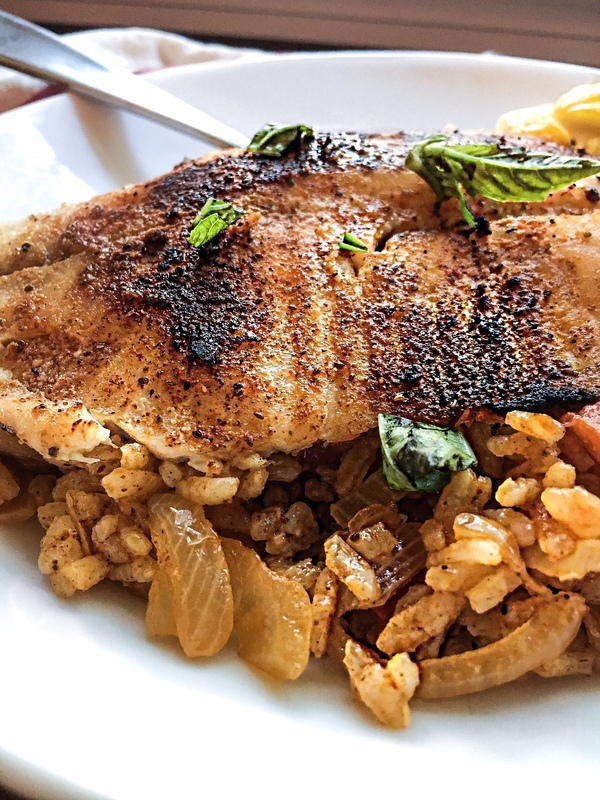 I’m not saying this dish is necessarily healthy because I do use a lemon butter sauce, but it is definitely lighter then the fried fish we usually eat. You can grill the fish in a grill pan if you don’t want to deal with preparing an outside grill, but I love the char you can get with an outside grill. Since we have been grilling so much fish I have learned a few tricks to set you up for success! 1. make sure you clean the grates on your grill really well and apply a very light layer of vegetable oil then wipe down with a paper towel 2. apply a very thin layer of olive oil, vegetable oil, or coconut oil to the fish before seasoning 3. salmon, tuna, and sword fish are usually thick enough to lay directly on the grate 4. delicate fish such as the tilapia I used needs to be placed on a grill plate or a piece of tin foil. Do you ever watch those videos on tips and tricks for commercial food? They use laundry pins and paper towels to prop food up. Spray with oil to get the food glistening. Taking pictures of real food is sometimes so difficult. So many bloggers make their food early in the day then reheat later. Currently I work around 50 hours a week and try to squeeze blog time in whenever I can. For this dish I had exactly one hour before the sun set to try and prepare the food and my “table setting”. Usually I have time to think about the colors and ways to really show you guys how delicious the food really is. 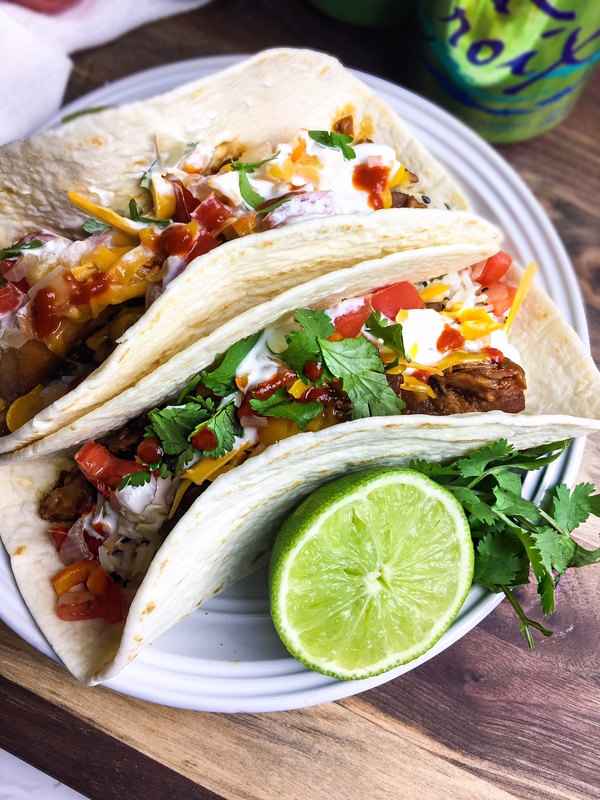 This recipe entailed a ton of comical mishaps along the way, but I had to post because it really is one of my favorite new meals! 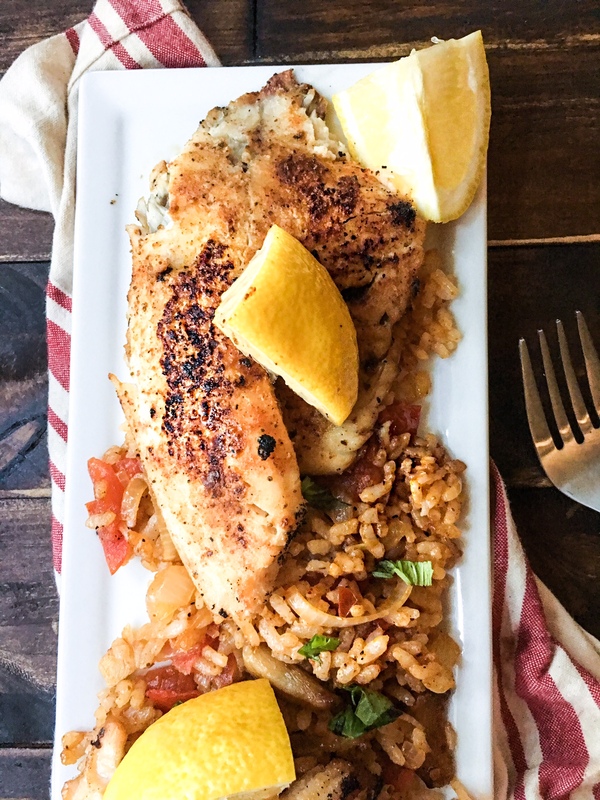 The rice has just enough crisp to offset the flaky fish and the lemon butter soaks right into each bite. I have always had this weird obsession with paellas. They are so bold and bright with deep flavors. One of the reasons I believe they are often forgotten is the hefty price tag associated with the dish. Saffron is one of the most common ingredients found in paella. This spice is usually around $15 for a handful. While I LOVE saffron I decided to trade it out for smoked paprika. You will still get a bold flavor and instead of the rich yellow or orange the paprika turns the rice a deep red. 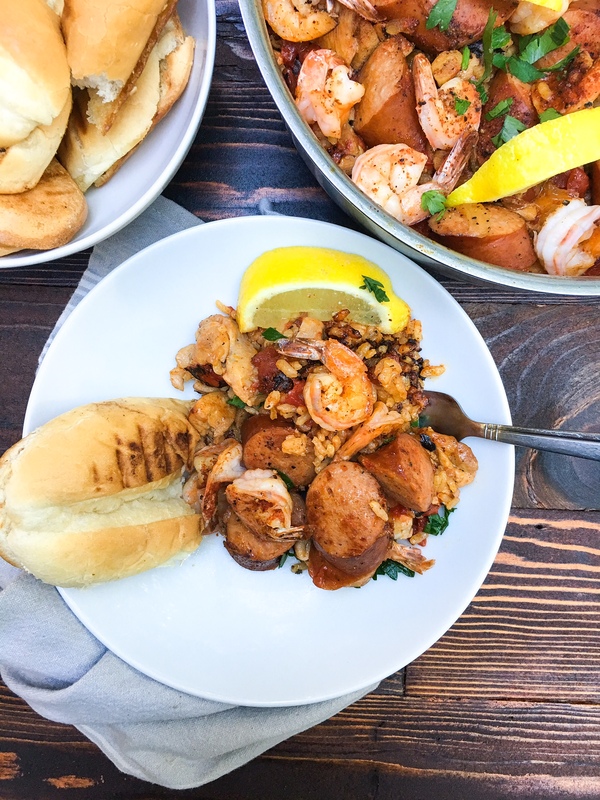 Another easy swap is using andouille sausage over the typical cured Spanish chorizo. When you pan fry the andouille you still get a ton of flavor to develop in a short amount of time. I love sauteing my veggies with the fried sausage to really add depth to every bite. My grocery store does not have paella rice ready available so I switched it for arborio rice. 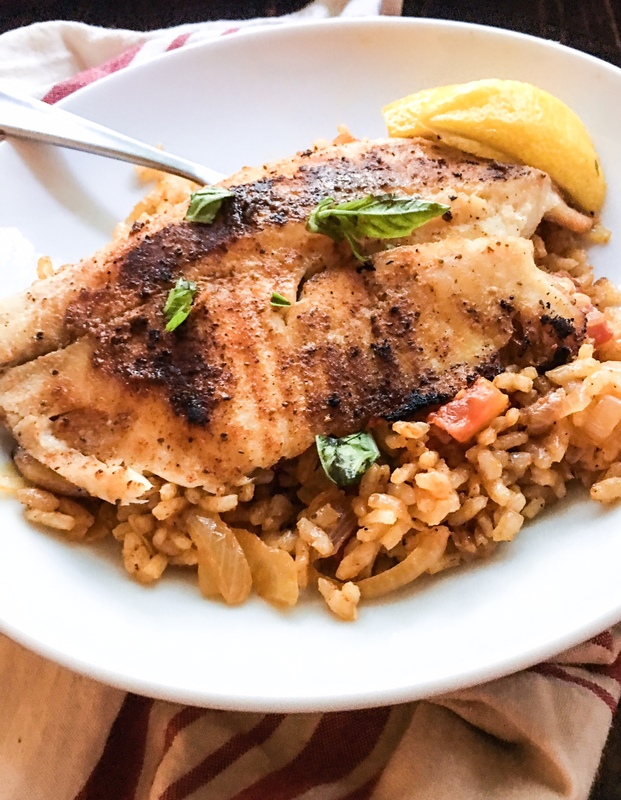 Arborio rice is just tiny enough to soak up every little bit of broth. I actually kept adding extra broth to make sure I still had a little sauce for my bread. I skipped out on the mussels just because those are not my personal favorite. You can definitely add a few in at the end. 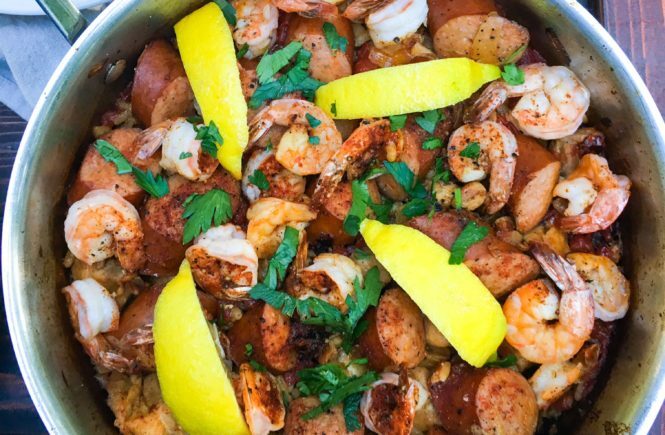 Boneless skinless chicken thighs and shrimp are what I look forward to in a paella. Both of these proteins usually have great prices in my area especially if you have a Sprouts farmers market near by. 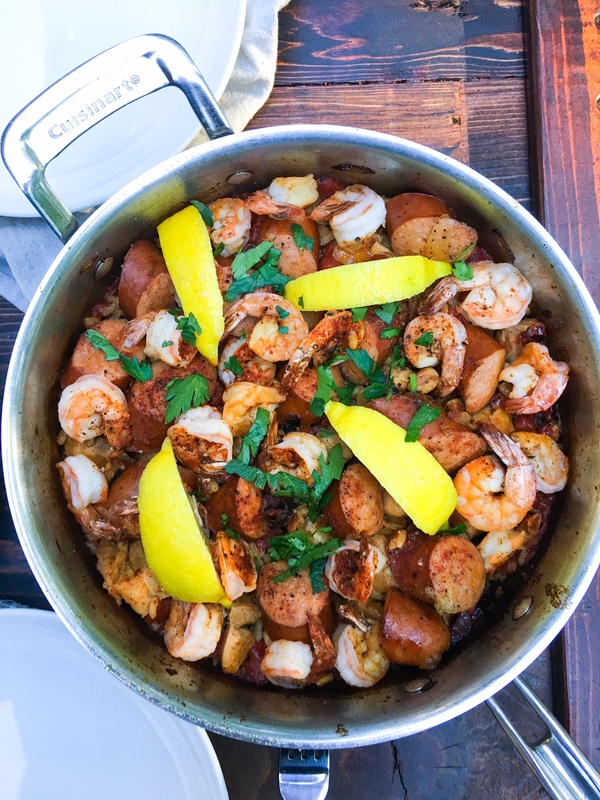 While I do believe an authentic paella taste is extremely hard to replicate without saffron- this affordable version is just as soul satisfying to me. It is such a beautiful dish and packed full of flavor. Honestly this came together so quickly as well. 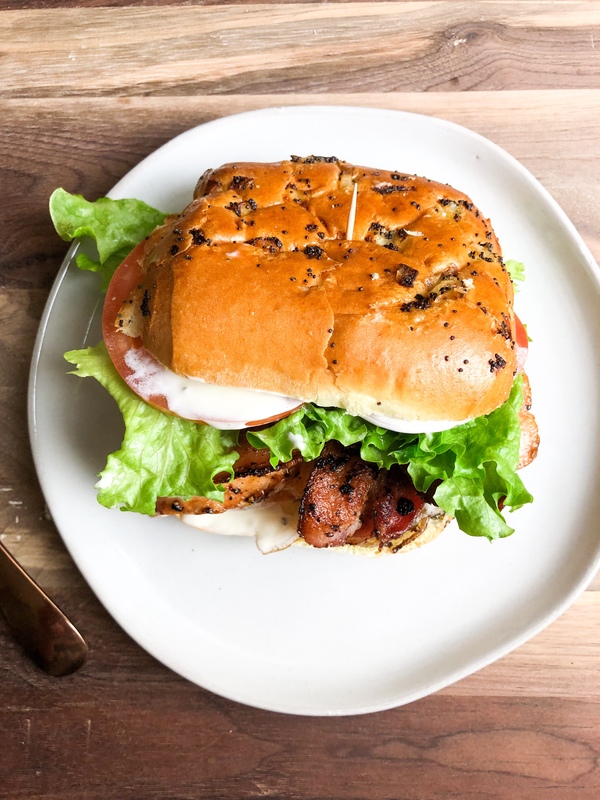 If you are looking to impress on a budget, this is the recipe to make! 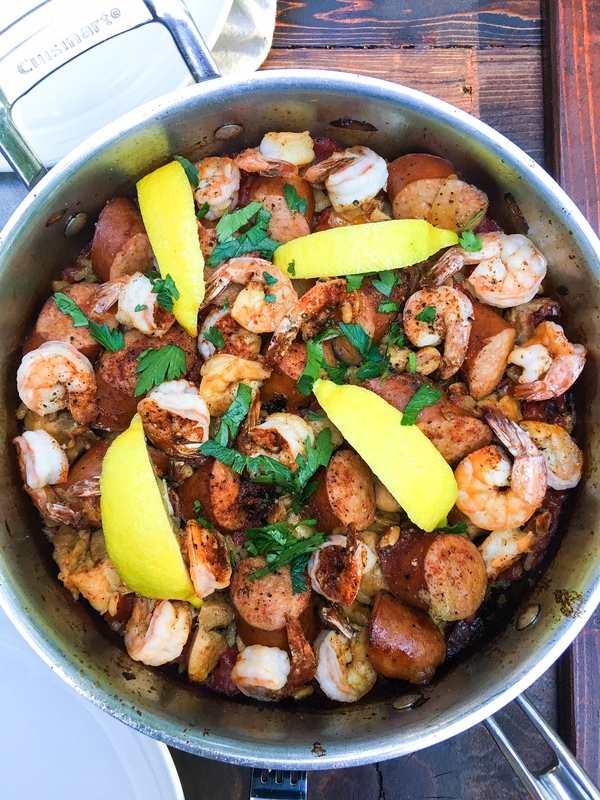 An easy way to impress with bold colors and flavors in this affordable paella. Heat a large paella pan or saute pan over medium heat. Add chopped onion and sausage. Fry until onions begin to be slightly translucent and the edges of the sausage starts to brown. Remove the sausage and set to the side. Add in the chicken and cook until golden brown. Season with salt and pepper, smoked paprika, garlic powder, red pepper and chili powder. Add in the stewed tomatoes and stir until all the rice is covered. Pour the broth over the top and stir into the rice. Lower to medium low heat. Add the sausage back in then cover. If your broth evaporates before the rice is done just add a little more on top. The important part is to make sure you do not stir the rice at all. When the rice is almost done (about 15 minutes) add the shrimp on top. Salt and pepper then cover. When all the liquid has absorbed and you start to hear a little crackling the rice is done. If you are unsure then just test the rice to make sure it has finished. Sprinkle with parsley and squeeze a little lemon over the top. I finish mine with Tabasco! Let me know if you try this recipe! 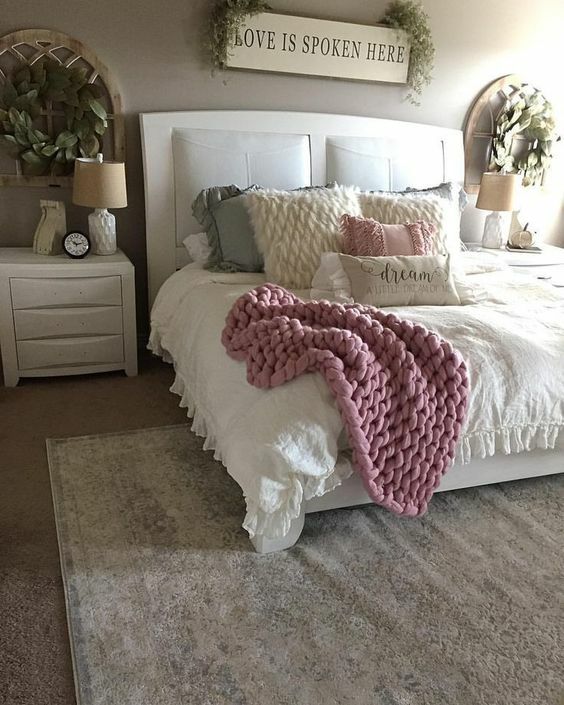 I know you will love it!